The first office ever posted on Office Snapshots was Pixar’s Emeryville headquarters – and is naturally one of the most popular. It is a place where, just by looking at it, one can tell that creativity abounds. After 5+ years of studying, posting pictures of, and writing about office design – it seems like a good idea to take an in depth look into just what makes their office space so special. The story behind Pixar’s headquarters starts in 1999 with Steve Jobs. As Pixar’s CEO, Jobs brought in Bohlin Cywinski Jackson – famously known for designing Bill Gates’ Washington residential compound – to flesh out his vision for the campus, which was planned to hold up to 1000 employees. According to Jobs’ recent biography, the headquarters was to be a place that “promoted encounters and unplanned collaborations.” Given that collaboration has recently been one of the major topics in office design, and that the late 90’s were filled with cubicle farms, his ideas were clearly ahead of the curve. Pixar’s campus design originally separated different employee disciplines into different buildings – one for computer scientists, another for animators, and a third building for everybody else. But because Jobs was fanatic about these unplanned collaborations, he envisioned a campus where these encounters could take place, and his design included a great atrium space that acts as a central hub for the campus. The atrium houses a reception, employee mailboxes, cafe, foosball, fitness center, two 40-seat viewing rooms, and a large theater – and was planned by Jobs to house the campus’ only restrooms. The idea was that people who naturally isolate themselves would be forced to have great conversations, even if that took place while washing their hands. Today, they do have more than one restroom, of course. But it was the idea behind it that was important. Jobs’ Meticulous Eye for… Steel Beams? Steve Jobs is well-known for his meticulous eye for elegance and design when it comes to Apple’s products. But another area where this fanaticism for detail came out was with regard to the steel beams used in the construction of the Atrium. And some additional investigation found that, “A field painter cleaned it again and applied a “clear coat” of paint to it. All of the bolts that were visible had round heads in lieu of hex heads to give the illusion riveted connections. Rivets have not been used since the 1950′s. 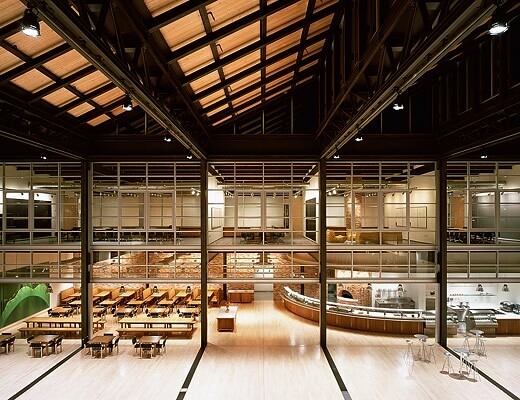 Moving beyond the atrium itself, the entire building plan was meant to provide a clean slate that gave Pixar the ability to creatively fill the space as it saw fit – in a very organic way. One fun way in which this organic creativity manifested itself was in the creation of a hidden speakeasy known as the Lucky 7 Lounge – which has been visited by many special visitors like Randy Newman, Michael Eisner, Michael Cera, and even Steve Jobs himself. Though the lounge was not in the original plan, allowing for fun and spontaneous elements was. Having tried a much more open, cubicle-based plan at their previous headquarters and noting the difficulty in getting work done, Pixar opted to go with a much more closed environment this time around. Many offices are arranged in U-shaped units of 5-6 individual offices – with a central gathering area in the middle that brings the idea of the creating unplanned collaboration down to a smaller, workspace-sized concept. In terms of decoration and style, employee office spaces are a sight to be seen. Some work in small house huts, other share space, some stand up. John Lasseter’s office (image right, click to zoom) is filled to the brim with toys – clearly not your average executive office. Many employees, especially animators, are given setups with 2-3 very large monitors, some 3d enabled with Pixar specific animation software that was developed in-house. Steve Jobs’ office was described as being the cleanest office at Pixar – which from the looks of it houses a very minimally spaced set of Eames Plywood chairs, a Noguchi Table, a Razor scooter, and not much else. Elsewhere in the campus lie office chairs that originally were owned by Walt Disney Studios from the 30’s. Though the original plan called for a very mid-century modern aesthetic, utilizing classic design as well as rugs that were handwoven by Tibetans in Nepal. The campus itself also houses modeling workshops, storyboard rooms, a massive render farm, and of course orchestra and sound recording facilities. The exterior campus includes a 600-seat outdoor amphitheater, a soccer field, and an organic vegetable garden used by Pixar’s chefs, flower cutting gardens and a wildflower meadow. And for both fun and fitness, they also have an olympic-sized swimming pool, volleyball court, jogging trail, and basketball court. In order to create the desired agrarian atmosphere, the exterior is filled with both native and exotic plants and trees – including European beech, live oak, palms, redwoods, Japanese maple, and cottonwood trees. The visitor entrance also boasts a series of beautiful rose gardens. An interesting point of contention in the development of the campus came, oddly enough, over Pixar’s desire to fence in the property during the second phase of the campus. Why fence in the property? Emeryville’s city council initially denied the expansion plans over the fence, but it seems after pressure from Pixar – and a threat or two to leave Emeryville – the plan (fence included) was approved. Creating a work environment that people enjoy working in can be one of the most challenging aspects of modern office design. And surely one of the most memorable features of Pixar’s are the many characters, both big and small, that find their way around the campus. Outside you’ll find a huge version of Luxo Jr., while the cast of The Incredibles and Monsters Inc. can be found within the atrium. Why do they do this? Sure it adds some brand value to a campus that otherwise might seem plain, but for a company like Pixar who slaves for many years bringing their films to life, I think it represents a connection to and love of their work. There can be no greater feeling that walking around the workplace and being reminded of the great work you helped to produce – as well as seeing the smiles of the many visitors as they recollect the ways each movie touched their lives. If you’ve been reading and thinking about how much your work environment need improvement in order to match up with Pixar, you aren’t alone. The company currently employs around 1200 people – has since built several more phases which have added room for more employees in additional buildings which include a rooftop garden, central hearth, as well as bringing much of the campus to LEED Silver certification. Much of the latest work has been completed by Huntsman Architectural Group, and Gensler. Now while the campus has expanded significantly past its original bounds, the plan designed around creating an atmosphere where creativity thrives is still very much intact. But while we can sit around and mope about how our offices are stiflingly terrible, we should actually be considering what things we can learn from this design and how we can implement them into our own workplaces. Be intentional about designing for collisions and unplanned collaboration – rather than using managerial force. Use the office space to remind employees why they work for the company. Make the office fun and a place employees want to work, rather than have to work. Allow employees to express themselves through their workspaces. While my original post on Pixar included some shots, I have since come across a number of additional campus views that I hope you will enjoy. Much of the following photography – specifically the beautiful architectural photography – was completed by Sharon Risedorph Photography. The photo of Luxo JR was taken by Jason Pratt.